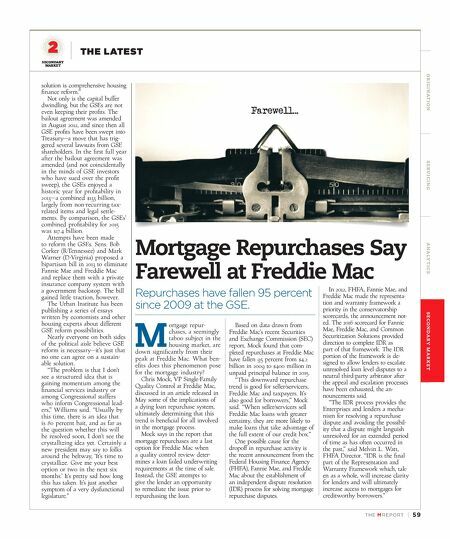 TH E M R EP O RT | 59 O R I G I NAT I O N S E R V I C I N G A NA LY T I C S S E C O N DA R Y M A R K E T SECONDARY MARKET THE LATEST Mortgage Repurchases Say Farewell at Freddie Mac Repurchases have fallen 95 percent since 2009 at the GSE. M ortgage repur- chases, a seemingly taboo subject in the housing market, are down significantly from their peak at Freddie Mac. What ben - efits does this phenomenon pose for the mortgage industry? Chris Mock, VP Single-Family Quality Control at Freddie Mac, discussed in an article released in May some of the implications of a dying loan repurchase system, ultimately determining that this trend is beneficial for all involved in the mortgage process. Mock says in the report that mortgage repurchases are a last option for Freddie Mac when a quality control review deter - mines a loan failed underwriting requirements at the time of sale. Instead, the GSE attempts to give the lender an opportunity to remediate the issue prior to repurchasing the loan. Based on data drawn from Freddie Mac's recent Securities and Exchange Commission (SEC) report, Mock found that com - pleted repurchases at Freddie Mac have fallen 95 percent from $4.2 billion in 2009 to $400 million in unpaid principal balance in 2015. "This downward repurchase trend is good for seller/servicers, Freddie Mac and taxpayers. It's also good for borrowers," Mock said. "When seller/servicers sell Freddie Mac loans with greater certainty, they are more likely to make loans that take advantage of the full extent of our credit box." One possible cause for the dropoff in repurchase activity is the recent announcement from the Federal Housing Finance Agency (FHFA), Fannie Mae, and Freddie Mac about the establishment of an independent dispute resolution (IDR) process for solving mortgage repurchase disputes. In 2012, FHFA, Fannie Mae, and Freddie Mac made the representa - tion and warranty framework a priority in the conservatorship scorecards, the announcement not- ed. The 2016 scorecard for Fannie Mae, Freddie Mac, and Common Securitization Solutions provided direction to complete IDR as part of that framework. The IDR portion of the framework is de - signed to allow lenders to escalate unresolved loan level disputes to a neutral third-party arbitrator after the appeal and escalation processes have been exhausted, the an - nouncements said. "The IDR process provides the Enterprises and lenders a mecha- nism for resolving a repurchase dispute and avoiding the possibil- ity that a dispute might languish unresolved for an extended period of time as has often occurred in the past," said Melvin L. Watt, FHFA Director. "IDR is the final part of the Representation and Warranty Framework which, tak - en as a whole, will increase clarity for lenders and will ultimately increase access to mortgages for creditworthy borrowers." solution is comprehensive housing finance reform." Not only is the capital buffer dwindling, but the GSEs are not even keeping their profits. 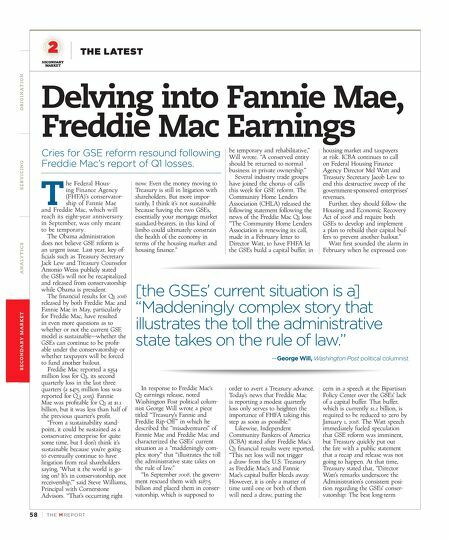 The bailout agreement was amended in August 2012, and since then all GSE profits have been swept into Treasury—a move that has trig - gered several lawsuits from GSE shareholders. In the first full year after the bailout agreement was amended (and not coincidentally in the minds of GSE investors who have sued over the profit sweep), the GSEs enjoyed a historic year for profitability in 2013—a combined $133 billion, largely from non-recurring tax- related items and legal settle - ments. By comparison, the GSEs' combined profitability for 2015 was $17.4 billion. Attempts have been made to reform the GSEs. Sens. Bob Corker (R-Tennessee) and Mark Warner (D-Virginia) proposed a bipartisan bill in 2013 to eliminate Fannie Mae and Freddie Mac and replace them with a private insurance company system with a government backstop. The bill gained little traction, however. The Urban Institute has been publishing a series of essays written by economists and other housing experts about different GSE reform possibilities. Nearly everyone on both sides of the political aisle believe GSE reform is necessary—it's just that no one can agree on a sustain - able solution. "The problem is that I don't see a structured idea that is gaining momentum among the financial services industry or among Congressional staffers who inform Congressional lead - ers," Williams said. "Usually by this time, there is an idea that is 80 percent bait, and as far as the question whether this will be resolved soon, I don't see the crystallizing idea yet. Certainly a new president may say to folks around the beltway, 'It's time to crystallize. Give me your best option or two in the next six months.' It's pretty sad how long this has taken. It's just another symptom of a very dysfunctional legislature."